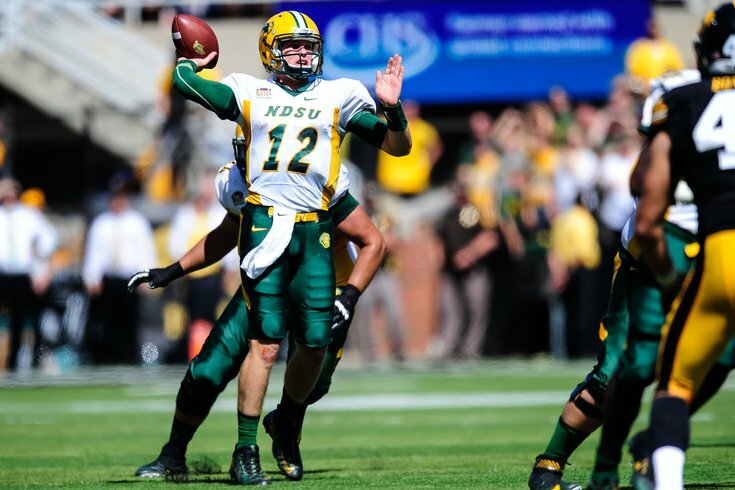 Could the Eagles dip into the North Dakota State quarterback pipeline again? Over the next couple of weeks, we'll be taking a look at each of the Philadelphia Eagles' positional groups. We'll determine if the Birds are likely to select a player at that position with one of their seven picks in the 2019 NFL Draft, as well as note some players who make sense. The Eagles would eventually trade McNabb, Feeley, Kolb, Foles, and Barkley, once they were no longer of use to the team, and in three of those cases, they received great value in return. While drafting quarterbacks has been a good long-term investment strategy for the Eagles, it wouldn't have made sense for them to draft one last year, with Carson Wentz, Nick Foles, and Nate Sudfeld in place. This year, with Foles now in Jacksonville and Sudfeld scheduled to become an unrestricted free agent next offseason, it would absolutely make sense to reintroduce that draft-and-develop tradition. But what kind of quarterback would they be looking for? "We’re very conscious of the culture," Lurie said, when asked about the getting back to the strategy of drafting quarterbacks with regularity. "We’ve had an incredible quarterback room, with Carson, Nick, and Nate. It’s one of the reasons they’re all so poised for success. That quarterback that we bring in – let’s say it’s this year’s draft or next year’s draft – it needs to be a great fit in that room, so you’re not just drafting a player that can be a good backup quarterback, but somebody that can help the culture with the quarterback who is starting. You want a relationship that is healthy, where they help each other. That’s a key part of it too." Earlier this week, the Eagles signed former AAF quarterback Luis Perez. To be determined if the Eagles view Perez as a legitimate No. 3 quarterback worth developing, or if they see him as a camp arm. Plucking a quarterback from the AAF instead of using a draft pick on one makes sense, but I'm not certain it closes the door on the team drafting one in the later rounds later this month. Obviously, Jackson has imposing size at 6'7, 249, he has a big arm (but can also throw with touch), and some nice athleticism. However, he's raw prospect with accuracy issues, a long delivery, and shaky feet. As a true developmental prospect, Jackson has the size the Eagles covet to go along with an appealing skill set. Selfishly speaking, he'd be a fun player to watch in training camp. As the son of a coach, Shurmur is thought of as an intelligent player who could add to the Eagles quarterback room culture. Yeah, it's easy to pinpoint the NDSU quarterback, since the Eagles already took one in Carson Wentz, but I do think they'll like Stick for some of the same reasons they liked Wentz. Like Wentz, Stick had a great GPA (3.91), and he even graduated in 3.5 years. He also ran an offense in Fargo with more pro-style concepts than most quarterbacks coming out of college, and is adept at running RPOs, particularly because of his good timing and mobility. At NDSU, Stick won two FCS National Championships. The Eagles have (mostly) brought in big quarterbacks, with a few exceptions, like Joe Callahan, Matt McGloin, and Aaron Murray, who are all listed at 6'1. The Eagles can work with Stick's mechanics behind the scenes, and perhaps get him to the point where his lack of arm talent isn't a significant hindrance. If they can do that, Stick is a prospect worth developing because of his intelligence and other skills.